An application developer and software tester with more than 20 years in the IT industry working on Windows, UNIX and Linux. In this guide, you will learn how to download a file using the Linux command line. Why would you want to do this? Why wouldn't you just use a web browser in a graphical environment? Sometimes there isn't a graphical environment. For instance, if you are connecting to your Raspberry PI using SSH then you are mainly stuck with the command line. Another reason for using the command line is that you can create a script with a list of files to download. You can then execute the script and let it run in the background. The tool that will be highlighted for this task is called wget. Many Linux distributions already have wget installed by default. In order to download files, you need to know at the very least the URL of the file you wish to download. 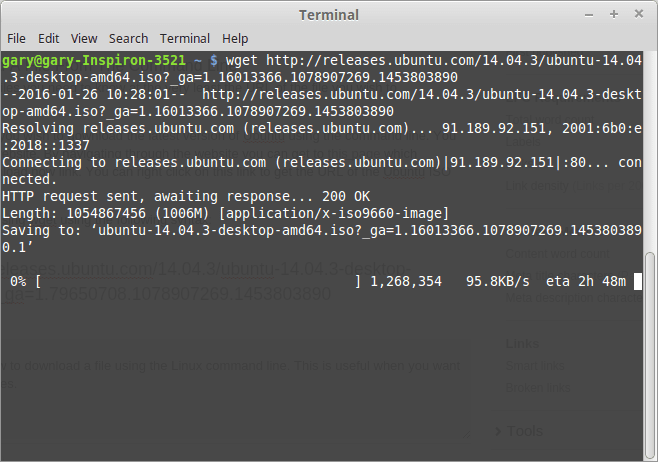 For instance, imagine you wish to download the latest version of Ubuntu using the command line. You can also download it directly from the Ubuntu website. Right click this link to get the URL of the Ubuntu ISO you wish to download. This is all well and good but you needed to know the full path to the file you needed to download. The above command copies the entire site including all the folders from the Ubuntu website. This is of course not advisable because it would download lots of files you don't need. It is like using a mallet to shell a nut. This is still a bit of a smash and grab approach to downloading the files you need from a website. It is much better to know the URL or URLs of the files you wish to download. Save the file using Ctrl+O and then exit nano using Ctrl+X. The trouble with downloading files from the internet is that sometimes the file or URL is unavailable. The timeout for the connection can take a while and if you are trying to download lots of files it is counter-productive to wait for the default timeout. If you have a download limit as part of your broadband deal then you might wish to limit the amount of data that wget can retrieve. The above command will stop the download of files once 100 megabytes has been reached. You can also specify the quota in bytes (use b instead of m) or kilobytes (use k instead of m). You may not have a download limit but you might have a slow internet connection. If you want to download files without destroying everybody's internet time then you can specify a limit which sets a maximum download rate. The above command will limit the download rate to 20 kilobytes per second. You can specify the amount in bytes, kilobytes or megabytes. If a file in the list of bookmarks already exists in the download location then it won't be overwritten. The internet as we know isn't always consistent and for that reason, a download can be partially completed and then your internet connection drops out. The wget command has dozens of switches that can be applied. Use the command man wget to get a full list of them from within a terminal window. Why Would I Use cURLand Not Wget? How Do I Change from One Directory to Another Using Linux?